Are Ireland really as bad as some pundits are making them out to be or have expectations for Irish rugby just risen to insane heights? 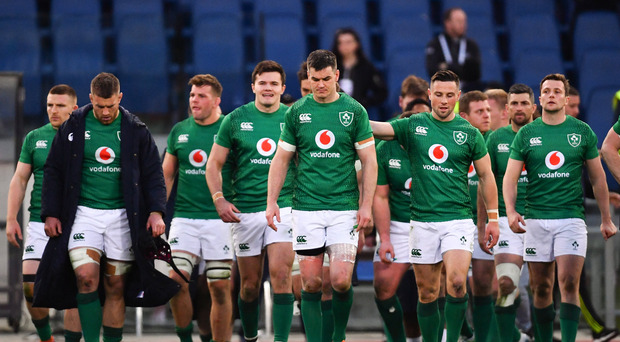 Luke Fitzgerald, Will Slattery and Cian Tracey review Ireland’s first three games in the Six Nations and wonder if the glass is half-full or half empty. "This isn’t the time for an overhaul," believes Luke. "But it is time to think about the basics that have been the bedrock of this team. The players are wanting it too much at the moment and look a bit tense and are over-running it a bit. They need to figure out how to want it whilst being calm to deliver on things. The lads need to go for a few drinks and just relax a bit." Two wins over France and Wales and the perspective would start to look very different with Cian pointing out that the team training in Belfast this week will be a welcome change of scene away from the intense bubble of Carton House. The panel also discuss the merits of picking Quinn Roux ahead of Iain Henderson, plus Luke defends his stance on Ulster rugby over the last few years, the abuse he has been getting on social media and why he’s sticking to his opinions. The Left Wing podcast is in association with Aldi. Will Slattery Leinster back row Jack Conan says that the team would love to be the first side in European Cup history to claim the 'historic' achievement of winning the tournament five times.